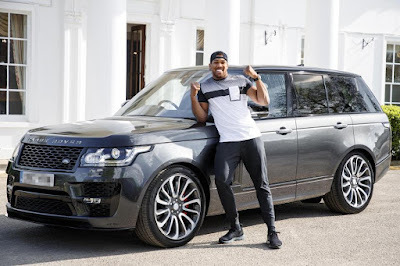 Boxing heavyweight Anthony Joshua has vowed to hunt down thieves who nicked his £150,000 bespoke Range Rover. The personalised luxury SUV – embossed with AJ’s signature – was stolen just days before his world title fight against Alexander Povetkin. The Sun UK reports that AJ was training at the English Institute of Sport (EIS) in Sheffield, South Yorks., when it was nabbed from a relative’s home in London on Thursday. His title belts are not believed to have been in the car at the time. Last night, a spokesman for AJ said: “A shared car was stolen from a relatives central London home in the early hours of the morning. A source said: “AJ’s pretty annoyed about it because it’s so close to the fight. He doesn’t want any distractions at all. “Thankfully no one was hurt when it was stolen. There were no aggravating features in it which is a massive blessing. “But this is probably one of the last things he wanted before the fight. Another source said: “Unluckily for the people who took it, there’s a tracker in it so it probably will come back at some point. Cops reckon thieves targeted the Range Rover using a keyless device that mimics a car’s key fob to break in. The £100 device can pick up the signal of the genuine fob and fool the car into thinking it’s being opened legitimately. Once inside, the thieves can override the keyless start with a simple computer.